The Goody brand is the most widely-recognized manufacturer of hair accessories and styling tools in the world. 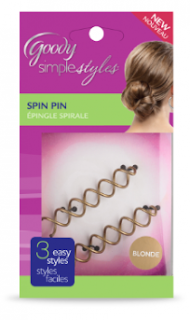 Through proprietary brands such as DoubleWear™, QuikStyle™, Simple Styles™, Slide-Proof™ and Ouchless®, Goody has introduced smart innovations like the exclusive Spin Pin and Quik Style Brush. With products inspired by the latest designer trends and innovative solutions, Goody offers an inspiring range of hair accessories and styling tools. My thoughts-I like Goody products. They make life easier for me and my thick, coarse hair. I like the spin pin. I like to wear my hair in a bun because it is easy and simple. It keeps my hair out of my hair and i wont get hot. Follow the directions and it could help you too. ***Disclosure-I received this product as part of my Influenster Beauty BoxVox.